During his talk, Christos Arvanitidis will discuss, among other topics, management policy and data use as well as the analytical applications of the Research Infrastructure LifeWatchGreece. 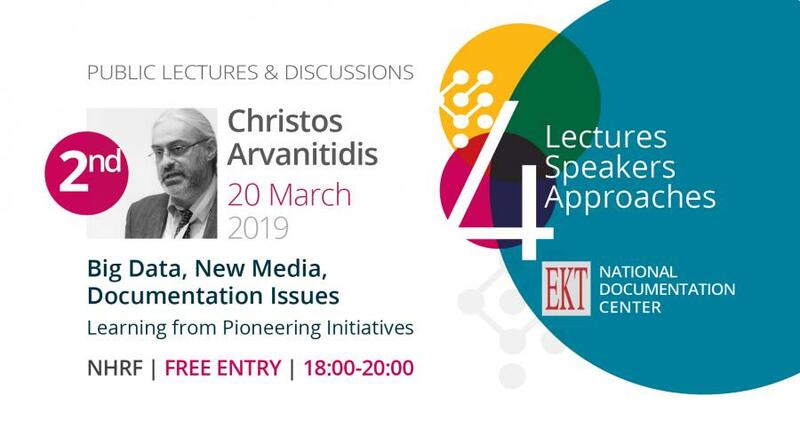 The series of Public Lectures and Discussions-‘Big Data, New Media, Documentation: Learning from Pioneering Initiatives’ from the National Documentation Centre, continues with a talk by Christos Arvanitidis, Head of Research, Institute of Marine Biology, Biotechnology and Aquaculture, Hellenic Centre for Marine Research (HCMR) on 20 March 2019 (18.00-20.00) in the L.Zervas amphitheatre, National Hellenic Research Foundation. (a) The MedOBIS Virtual Lab (MedOBISvLab) hosts, manages and shares marine biodiversity data, which feature geo- and bio-annotation and references. (b) The Microtomography Virtual Lab (micro_CT vLab) hosts. manages, analyses and disseminates big data from the field of microtomography. (c) The R Virtual Lab (R_yLab) has extensive environmental data and is widely used by scientists and researchers. Christos Arvanitidis is Head of Research, Institute of Marine Biology, Biotechnology and Aquaculture, Hellenic Centre for Marine Research (HCMR). His research focuses on: marine biodiversity, biodiversity infomatics, functional diversity and coastal ecosystems. He also co-ordinates the research infrastructure LifeWatch Greece and is national representative for LifeWatch ERIC He has been a member of the UN’s World Ocean Assessment Expert Group, advisor for the European Network of Marine Research Institutes and Stations, the Society for the Marine European Biodiversity Data, the editorial board of the World Register of Marine species and the scientific board of the Institut Méditerranéen de Biodiversité et d'Ecologie marine et continentale. This series of lectures, which began on 6 December 2018 with a lecture by Andreas Fickers, aims to highlight the problems associated with Big Data, New Media and documentation. Admission is free (no registration required) and participation certificates will be given to all those attending.